No driver is required for Mac OSX computers. Mac OS standard audio driver will be automatically installed when the DDJ-WeGO3 is connected to your Mac with a USB cable. A Pro Infinity, a Plus Controller or a Pro Subscription License is required to fully use the Pioneer DDJ-WeGO3 Without any of the above Licenses, the controller will operate for 10 minutes each time you restart VirtualDJ. The Pioneer DDJ-WeGO3 is also operating with the bundled VirtualDJ Limited Edition. 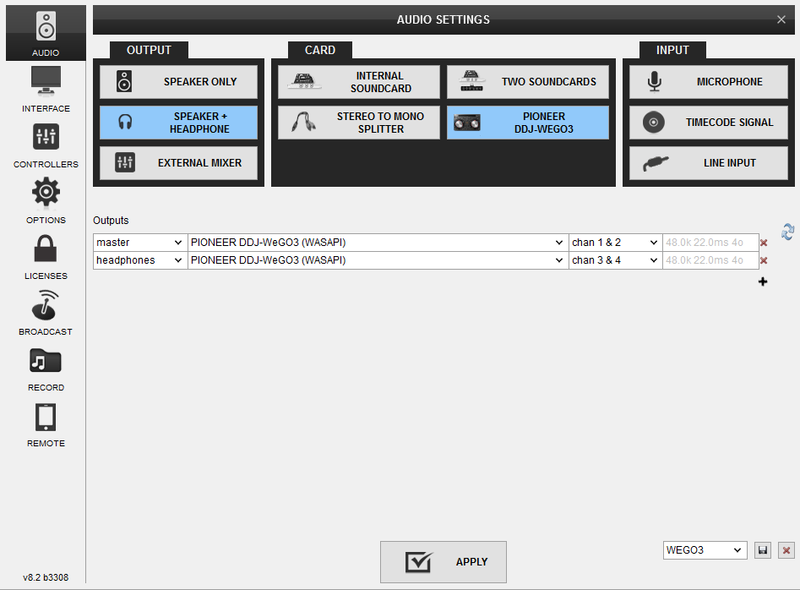 A detection window will appear right after, asking to use or not the pre-defined audio setup with the built-in sound card of the DDJ-WeGO3 Click on the "Use Soundcard" if your speakers are connected to the Master Output of the DDJ-WeGO3. If the tailored WeGO3 skin is pre-installed, an additional button Change Skin will be available to load the skin, or continue with the default skin of VirtualDJ 8.